Janet Szabo is a nationally-known knitting designer, author, and teacher. Her designs have been featured in Cast-On, Knitter's Magazine, The Complete Knitting Collection, and Knitting NOW. She has appeared as a guest on the DIY Network show Knitty Gritty and has taught at workshops and conferences around the country. Janet Szabo is also the editor and publisher of Twists and Turns: The Newsletter for Lovers of Cable Knitting. Janet lives in northwest Montana with her husband and two daughters. Seventeen years ago, Janet Szabo had no idea she would wind up living in Montana as professional knitter. Instead of medical school, as she'd planned, she got married and worked as a technical support specialist for a software company. Janet's husband had a lifelong fantasy of moving to Montana. This fantasy became reality after they completed the renovation of an old farmhouse in Pennsylvania and had their first child. Nine months after arriving in Montana Janet was diagnosed with leukemia. She then spent six months in Cleveland undergoing chemotherapy. Fortunately, her leukemia went into remission and has stayed there since. One thing Janet learned from having a potentially fatal illness was that healing takes time. It was during this time in Janet's life she needed something to give her motivation to get up in the morning and not focus on her illness. Janet focused on knitting projects and spent much of her time knitting. As good-paying jobs are scarce in Montana Janet needed to find something she could do at home. It was Janet's husband's comment "...you're always knitting, can't you figure out some way to make money doing it?" that challenged her to kick-start her professional knitting career. Janet describes herself as more determined than talented and believes that that the most successful people are the ones who are the most determined. For Janet success is a lot more than money or fame. Success is a job she loves that allows her to be at home with her two kids, manage her husband's construction business, putter in her garden, enjoy the beauty of Montana, and (of course) knit a lot. * "Cables, Volume 1: The Basics, Aran Sweater Design"
* Several articles for knitting and spinning magazines. 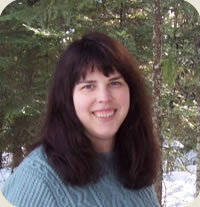 Janet Szabo is a TKGA Master Knitter and has been teaching at Stitches since 1999.